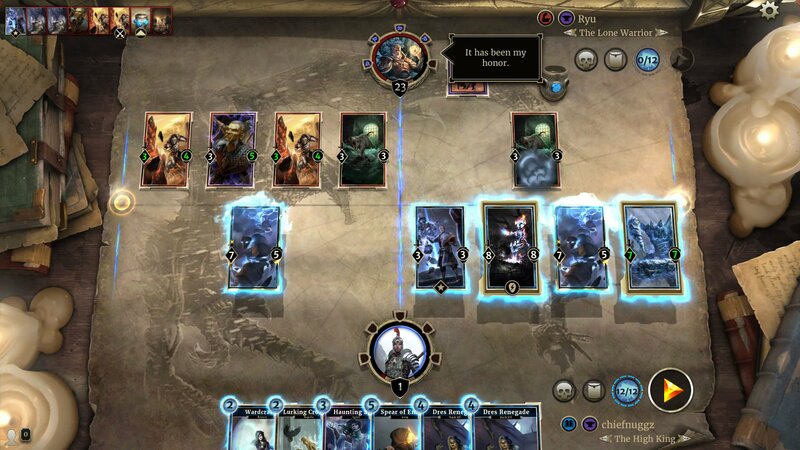 It wasn't too long ago that Bethesda and Dire Wolf Digital's collectible card game The Elder Scrolls: Legends made its initial release, and in the nearly five months since it formally landed on players' PCs, the game has slowly made its way onto iPads, Android tablets, and just recently, mobile phones. Shortly before the game made its proper mobile debut, players were introduced to an all-new expansion called Heroes of Skyrim that brought into the game over 150 new cards based around Bethesda's most popular title, The Elder Scrolls V: Skyrim. The new cards drastically change the strategic opportunities within Legends, and mobile players just now picking up the CCG title have a dizzying amount of cards with which to learn, build, and play. Still, sometimes less is more — the Heroes of Skyrim expansion cards might serve to balance out some of Elder Scrolls Legends' more popular decks, but for players familiar with the old ways or mobile players that are just now jumping into the action, the Heroes of Skyrim expansion feels like too much and too soon. 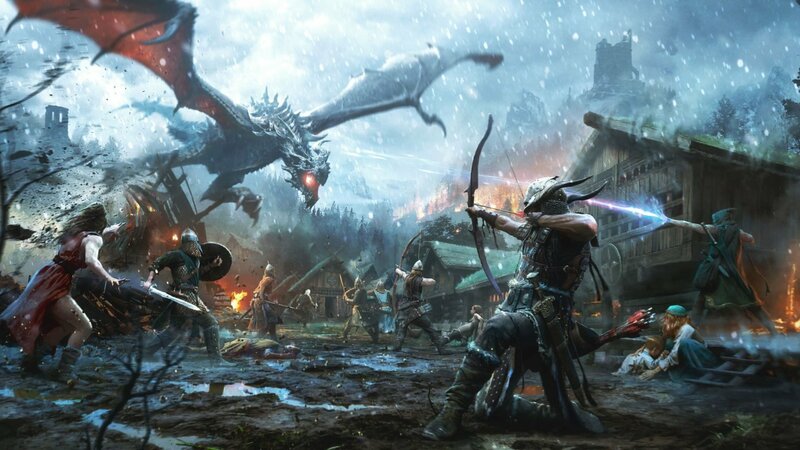 The Elder Scrolls: Legends has always been steeped in Elder Scrolls lore, but Heroes of Skyrim goes right for the massive demographic of RPG fans that are well-versed in the characters and history of Skyrim. As such, many of the new cards were created around the features and abilities of iconic Skyrim characters — Aela, Lydia, J'Zargo, the Greybeards, Ulfric Stormcloak; even Parthurnaax and Alduin make appearances in Heroes of Skyrim, to say nothing of themed cards like Word Wall, Journey to Sovngarde, or A Night to Remember. The most noteworthy additions to the Heroes of Skyrim lineup are the addition of Shouts, which are 1- to 3-cost action cards that increase in power each time they're played. Each card class has its own unique shout: Strength decks have Unrelenting Force, which unsummons weak cards at level one and unsummons all cards in a lane at level three; Intelligence has Fire Breath, which does 2 damage to a creature at level one and 10 damage at level three; Willpower has Call of Valor, which summons a 3/3 Sovngarde Hero at level one and fills a lane with Sovngarde Heroes at level three; Agility has Drain Vitality, which imparts -1/-1 on a single creature at level one and -2/-2 on all enemy creatures at level three; lastly, Endurance has Soul Tear, which draws a creature from the discard pile at level one and draws a creature and buffs it +5/+5 at level three. 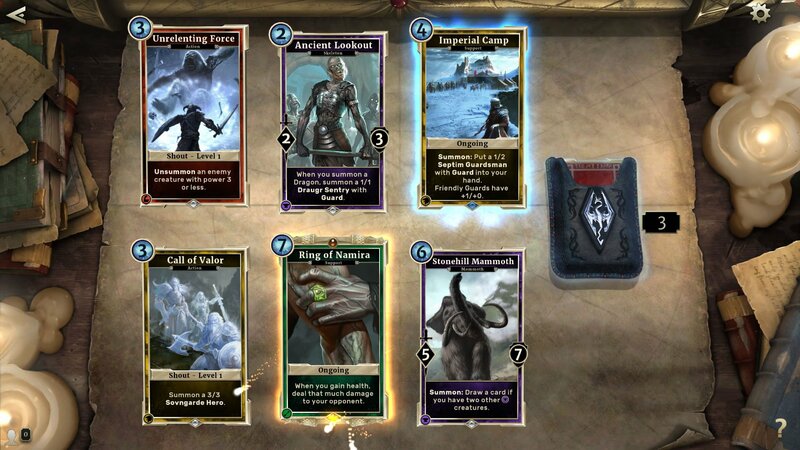 In addition to new Skyrim-based cards, Heroes of Skyrim also presents a huge number of cards that create new synergies with existing cards. New additions like Dark Rebirth allow players to trigger the summon abilities of cards, while Beast-oriented cards get upgrades any time players break enemy runes. Heroes also introduces a number of powerful Dragon cards, which often have the ability to instantly Battle enemy creatures, as well as Lookout cards, which provide bonuses like health or card draws any time a Dragon is summoned. The incredible supply of new cards that Heroes of Skyrim introduces within The Elder Scrolls: Legends means that players shouldn't ever have trouble finding cards to suit a deck they'd like to build. Unfortunately, therein lies the problem: with so many different options, even players that know what kind of deck they want will have difficulty putting together a deck that actually works. In many cases, some of the cards that were considerably powerful before Heroes of Skyrim are now ineffective to the point of being useless, either because there are more preferable combinations now or because another card provides the same abilities in a cheaper or more powerful package. Naturally, if the bevvy of options is confusing to players already familiar with the game, then newcomers might have no idea where to begin. Putting together a deck of cards that builds toward a concept — like a Pilfer Monk or Action Mage — is fairly straightforward: players can just use the search tool in the deck builder to find cards that have that ability. But in practice, decks built toward keywords don't often work — they lack early-game options, removals, or even general balance. As it was before, players who want efficient decks are left browsing the net for ideas or watching Twitch streams to see which decks other players use. Normally, that wouldn't be much of an issue. However, since Heroes of Skyrim brings around 150 new cards to the table, the decks players might find online likely include dozens or more cards that those players don't have. As if being confused and low-leveled isn't enough, newcomers will also face an uphill battle as they grind for the coins and soul gems they need to put together more efficient decks — only to watch the one deck they've worked toward become useless in an ever-evolving meta game. Despite how it may seem, Heroes of Skyrim does do several things right for both existing players and Elder Scrolls: Legends newcomers. 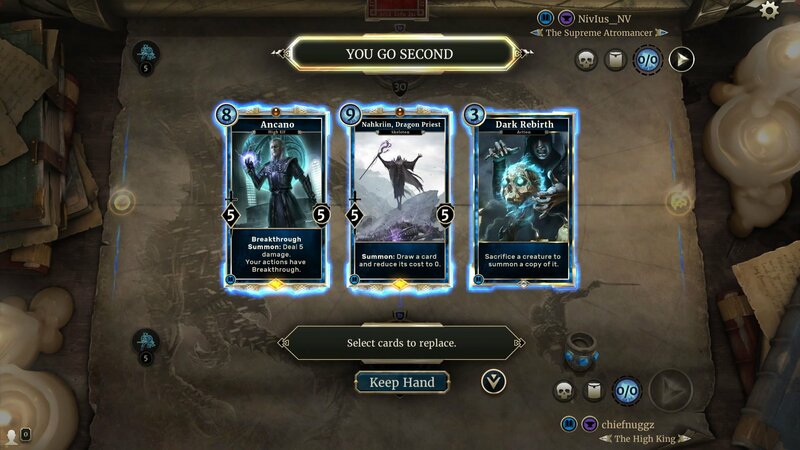 Players can buy card packs same as before, using either in-game gold or real-world currency, but Dire Wolf Digital has included the option to buy new Heroes of Skyrim packs, which guarantee players six cards that come exclusively from the new expansion. This makes it very easy to continue building toward complete core sets as well as complete Heroes of Skyrim sets. Even better than that are the addition of the game's first-ever pre-built decks. Players can use in-game gold to buy powerful decks in set classes, like Ancano's Cunning, Aela's Huntmates, or Alduin's Apocalypse. More than that, these decks only cost 500 gold, and they come with a copy of every card used in them, meaning players get at least one guaranteed Legendary card and up to 49 other cards as well. These pre-constructed decks represent both an immense value for players trying to collect Heroes of Skyrim cards as well as a great opportunity for new players to see how cards work together in-game, as each deck works toward a specific playstyle. In theory, Heroes of Skyrim is a great expansion to the game: it presents new cards, new abilities, new Legendaries, and new strategies for players regardless of their preferred classes. However, the given options are so vast that it's easy to get lost in the mix, and newcomers — particularly those who are just now picking up The Elder Scrolls: Legends for mobile devices — might find themselves dropped so far into the deep end that they may never find their way out. Seems like sticking with family-friendly titles is no longer Nintendo's modus operandi.